A school where everyone shines. Achieve – excellence in teaching and learning which excites and inspires our children to be the best they can be. Happiness – smiling, engaged and articulate children who are listened to, encouraged and given every support to maximise their own individual potential. Friendship – children who are kind and caring towards each other, building lasting friendships. Respect – a respect for people, each other’s beliefs, our environment and all living things. Responsibility – independent, creative thinkers who have the confidence to be responsible for themselves, their behaviour and for others. 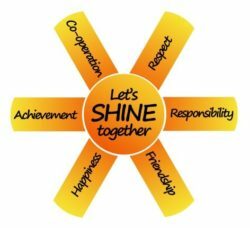 Co-operation – working together, listening and valuing others’ opinions within the school family and the wider community. To value, recognise and nurture the uniqueness and achievements of every member of our school family, in all areas of learning, irrespective of ability, gender or background. To demonstrate and instill self-discipline in order to achieve and maintain high standards of behaviour and form good relationships. To equip children with the resilience and perseverance to become learners for life within an ever-changing world. To provide a wide and varied Curriculum, making it accessible to all children, with emphasis on the basic skills of English, mathematics, science and computing. To develop learning activities which stimulate positive models of enquiry, reflection, challenge and innovation, allowing all children to think logically, creatively and critically. ‘I have been impressed with the drive and commitment of the whole staff team to continually improve and provide exceptional education to pupils in an environment that is supportive, secure and conducive to learning. The whole team at West Hill are proud to be Outstanding and share a desire to maintain this status.’ June 2012 Investors In People Assessment Report.